If you love sea turtles, you were probably HIGHLY disturbed at the latest news out of Australia: A photo just went viral showing two men standing on a turtle, sparking outrage amongst animal lovers and those invested in endangered species. According to the Honolulu Star Advertiser, Instagram user Ricky Rogers uploaded the infamous photo with the caption “Surfed a tortoise on zee weekend.. gnarly duddddeeeee,” and it has animal welfare workers livid. Here’s just one example of the many responses: “These guys are just complete idiots. There’s no way they should be doing what they were doing,” Michael Beatty, spokesman for Royal Society for the Prevention of Cruelty to Animals in Queensland, told the Fraser Coast Chronicle. Despite this outrageous act, the photo prompted me to wonder: What do I do if I see an injured sea turtle? How close can I get to a sea turtle without breaking the law? What ARE the rules regarding sea turtles in Hawaii anyway?! Along with a few other species of sea turtles, the green sea turtle is listed as a threatened species under federal and state law. The green sea turtle and hawksbill sea turtle are the species most frequently observed in Hawaii. Three other species occur, but are very rarely seen in our coastal waters. The green sea turtle is listed as a threatened species under federal and state law. Hawaii’s green sea turtles have shown a good population recovery in recent years, although they are still plagued with a papilloma virus that causes disfiguring tumors. Hawksbill sea turtles, listed as an endangered species, are sighted much less frequently than greens. To report a sea turtle in trouble (injured, stranded, hooked, entangled, etc. ), go to the NOAA sea turtle reporting website. Please report immediately and follow the handling guidelines on the NOAA website above. To report sea turtle disturbance or legal violation, please call the NOAA Office of Law Enforcement Hotline: 1-800-853-1974 and then call DLNR, Division of Conservation and Resources Enforcement (DOCARE) statewide hotline: 643-DLNR (3567). If a sea turtle looks sick, keep this in mind: Most turtles that haul-out on the shoreline are just fine. They may lie very still, as if they are not breathing, but that’s normal. Please keep your distance; do not try to get close to the animal. They need to be allowed to rest undisturbed. If you see an obvious sign of injury, such as an open wound or entanglement in rope or net, please call the NOAA hotline at (808)-725-5730. After hours, on weekends and holidays, call(808)-286-4377. 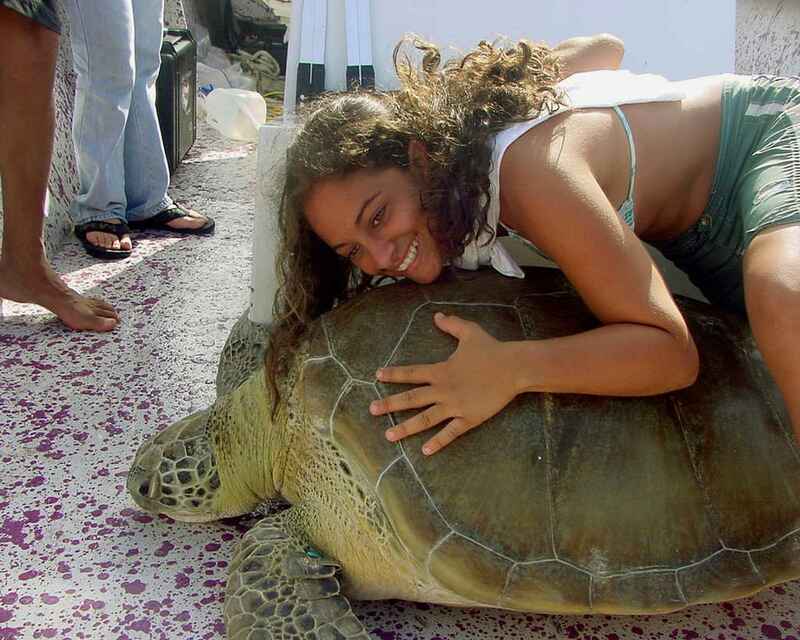 This is an example of what NOT to do when you come into contact with a sea turtle. To report sea turtle disturbance or legal violation, please call the NOAA Office of Law Enforcement Hotline. If you accidentally hook a turtle while fishing, call the NOAA sea turtle hotline at (808)-725-5730 and follow instructions, and/or visit NOAA’s fishing around sea turtles web site for instructions. There is no law specifying the minimum distance people can approach a sea turtle. However, getting close to these animals may constitute a federal or state violation if the animal is disturbed or if your action has the potential to disturb its natural behavioral patterns. NOAA and DLNR recommend, for your safety and the animals’ protection, that everyone stay at least 150 feet from all sea turtles. If maintaining this distance isn’t possible, keep safety in mind and move away from the animal as carefully as possible, avoiding sudden movements and other actions that might disturb the animal. For wildlife viewers, please enjoy from a distance — use binoculars and telephoto lenses to get the best views without disturbing the wildlife. 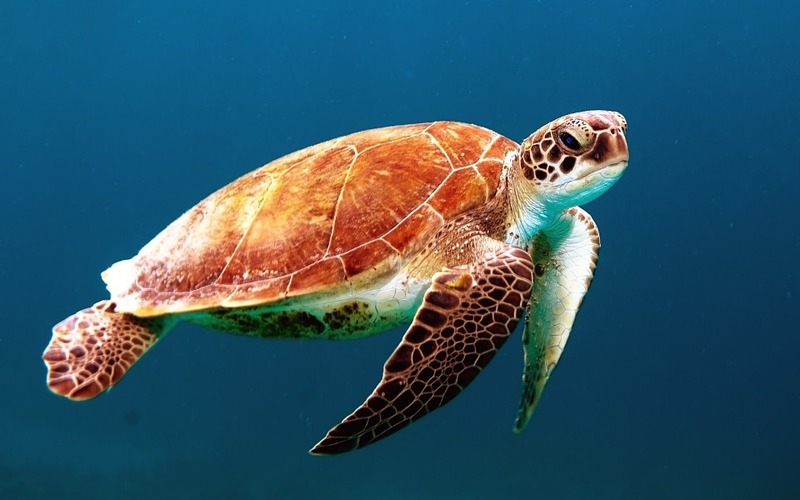 If you want to see sea turtles up close and be sure you’re not endangering them, just book a visit to Sea Life Park through Hawaii Aloha Travel! You’ll enjoy deep discounts off general admission, enjoy transportation from your hotel, and have the opportunity to spend the day at a fun and educational marine park! When it comes to sea turtles in Hawaii, caution is extremely important — although their numbers have grown, their survival still depends on how well we humans interact with them!